This isn’t Savelii Kaliupanov’s first unusual app. In fact you could justifiably say that his apps have their own idiosyncrasies. Lalalab is itself based on part of Savelii’s Deregulator app. His last app before this one was zhsh, which he describes as “Noise-centered and barely musical audio-effect application”. But back to Lalalab. Savelii describes his latest creation as being able to create long, rhythmically undetermined echoes with a cautious and discreet implementation. 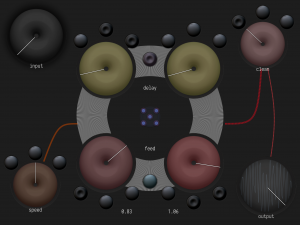 Lalalab is designed in “iced donuts” style like his other apps, and is part of Deregulator’s Echo engine with parameters for “delay”, “feedback” and “speed” of changing random values. Lalalab has a limiter to suppress loud noise bursts, but as previously mentioned, you probably need to exercise some caution when trying this app.